Kronstadt, also spelled Kronshtadt, Cronstadt (German: Krone for Crown and Stadt for City) is a Russian seaport town, located on Kotlin Island, thirty kilometres west of Saint Petersburg near the head of the Gulf of Finland. 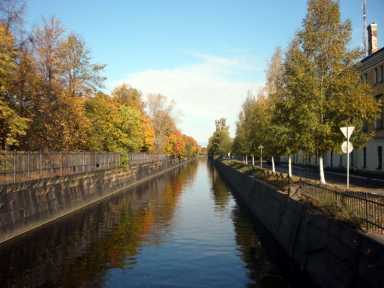 It is under the administration of the federal city of Saint Petersburg and is also its main port. In March 1921 it was the site of the Kronstadt rebellion. Traditionally, the seat of the Russian admiralty and the base of the Russian Baltic Fleet were located in Kronstadt guarding the approaches to Saint Petersburg . The historic centre of the city and its fortifications are part of the World Heritage Site Saint Petersburg and Related Groups of Monuments. saint of the Russian Navy. 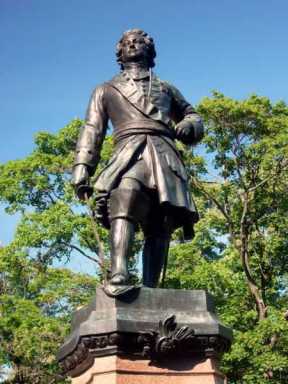 Kronstadt was founded by Peter the Great, who took the island of Kotlin from the Swedes in 1703. The first fortifications were inaugurated on 18 May 1704. These fortifications, known as Kronstadt's Forts, were constructed very quickly. The Gulf of Finland is not very deep, so during the winter it completely freezes through. Workers used thousands of frames of oak logs filled with stones. These were carried by horses across the frozen sea, and placed in cuttings made in the ice. Thus, several new small islands were created, and forts were erected on them, closing all access to Saint-Petersburg by the sea. Only two narrow navigable channels remained, and the strongest forts guarded them. Kronstadt was thoroughly refortified in the 19th century. The old three-decker forts, five in number, which formerly constituted the principal defences of the place, and defied the Anglo-French fleets during the Crimean War, became of secondary importance. From the plans of Eduard Totleben a new fort, Constantine, and four batteries were constructed (1856-1871) to defend the principal approach, and seven batteries to cover the shallower northern channel. All these fortifications were low and thickly armoured earthworks, powerfully armed with heavy Krupp guns in turrets. The town itself is surrounded with an enceinte. In 1921 a group of sailors and soldiers and their civilian supporters rebelled against the Bolshevik regime in Soviet Kronstadt. Their demands included freedom of speech, a s top to the deportation to concentration camps, a change of Soviet war politics and the liberation of the soviets (workers' councils) from Party control. After brief negotiations Leon Trotsky, then the Minister for War in the Soviet Government and the leader of the Red Army, answered by sending the army to Kronstadt, and the uprising was ruthlessly suppressed. This was the last major revolt against Communist rule within Russia proper until the dissolution of the Soviet Union in 1991. 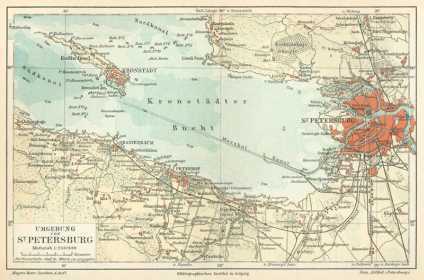 During World War II, Kronstadt was bombed several times by Nazi Germany's air force, the Luftwaffe. The most famous bombing was Stuka ace Hans-Ulrich Rudel's sinking of the Soviet battleship Marat. The town of Kronstadt is built on level ground and is thus exposed to inundations, the most famous being in 1824. On the south side of the town there are three harbours: the large western or merchant harbour, the western flank of which is formed by a great mole joining the fortifications which traverse the breadth of the island on this side; the middle harbour, used chiefly for fitting out and repairing vessels; and the eastern or war harbour for vessels of the Russian navy. The Peter and Catherine canals, communicating with the merchant and middle harbours, traverse the town. Between them stood the old Italian palace of Prince Menshikov, the site of which was later occupied by a pilot school. 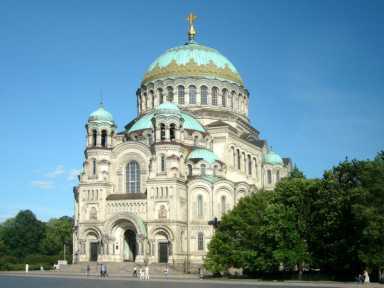 The modern town's most striking landmark is the enormous Naval Cathedral, built from 1908 to 1913 and considered to represent a culmination of the Russian Neo-Byzantism. 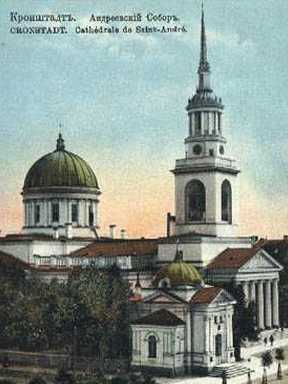 The older St Andrew Cathedral (1817), formerly Kronstadt's pride and beauty, was destroyed on communist orders in 1932. St Ioann of Kronstadt, one of the most venerated Russian saints, served there as a priest from 1855 to 1908. Among other public buildings are the naval hospital, the British seamen's hospital (established in 1867), the civic hospital, admiralty (founded 1785), arsenal, dockyards and foundries, school of marine engineering, and the English church. 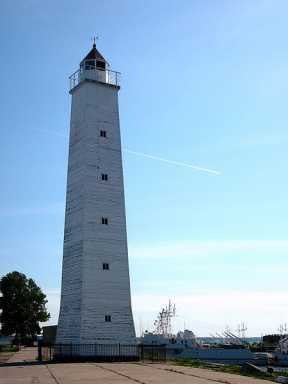 The port is ice-bound for 140 to 160 days in the year, from the beginning of December to April. A very large proportion of the inhabitants are sailors. The Kronstadt Sea Fortress used to be considered the most fortified port in the world. It has never been taken by an outside force. Kronstadt still retains some of the "forts", small fortified artificial islands. Formerly there were 42 such forts, situated in line between the southern and northern shores of the Gulf of Finland. Some fortifications were located inside the city itself and one was on the western shore of the Kronslot Island (on the other side of the main navigational channel). Nowadays, the construction of the Saint Petersburg Dam has led to some of the forts being demolished. The dam also permitted Kronstadt and some of the forts to be reached without using a boat. Among the most important surviving forts are the Fort Konstantin, the biggest in the Gulf of Finland; the Fort Rif on the western shore of the island; and the particularly well-preserved Chumnoy Fort (Plague Fort). The largest and the newest of the forts, constructed at the beginning of the 20th century, is Fort Totleben, named after Eduard Totleben. This page was retrieved and condensed from (http://en.wikipedia.org/wiki/Kronstadt) see Wikipedia, the free encyclopedia, January 2008.